Make oily and shiny skin a thing of the past with Germaine de Capuccini's Pure Expert Oily Skin Programme. Designed specifically for those with oily skin, this 3-step programme purifies the skin, reducing dilated pores and acne whilst mattifying the complexion. Germaine de Capuccini Pure Expert Oily Skin Programme contains Pure Expert Mattifying Foam (30ml), Pure Expert Refiner Essence for Oily Skin (50ml) & Pure Expert Oil-Free Hydro Matt Gel (50ml). The Purexpert 1-2-3 programmes helps to maintain skin that is free of imperfections, premature wrinkles and dilated pores. All in three quick and simple steps. 1. CLEANSE to achieve pure, matt skin and prepare the skin for the following steps. 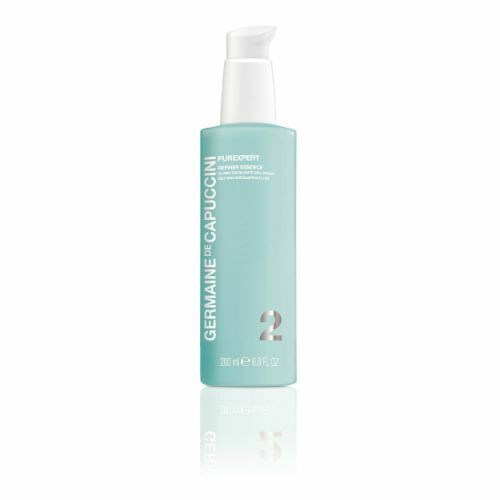 Purifying Mattifying Foam (30ml.) Apply onto moistened skin, massage in circular movements and remove with warm water. 2. RENEW to eliminate dead cells from the skin. Refiner Essence Oily Skin Exfoliating Fluid (50ml) Moisten cotton wool with the Essence and apply to the whole face, taking care around the eye contour area. 3. HYDRATE to restore the skin’s healthy appearance and protect against external aggression. Oil-Free Hydro-Mattifying Gel-Cream (50ml) Apply a small amount morning and night after the Refiner Essence. This programme will leave oily skin and skin with acne more purified and more mattified. If you have oily skin use Germaine de Capuccini Pure Expert Oily Skin Programme continuously. I am huge fan of Germaine de Capuccini face care product and Grooming clinic is only place where the price is acceptable and free delivery is offered. So I am coming back for sure next time when I need to top up my cosmetics.